Are you bewitched by the first season of the A Discovery of Witches TV show on BBC America and AMC? As we all know, the Nielsen ratings typically play a big role in determining whether a TV show like A Discovery of Witches is cancelled or renewed for season two (it’s been renewed). Unfortunately, most of us do not live in Nielsen households. Because many viewers feel frustration when their viewing habits and opinions aren’t considered, we’d like to offer you the chance to rate all of the A Discovery of Witches season one episodes here. Originally a Sky One and Sundance Now fantasy drama, A Discovery of Witches stars Teresa Palmer, Matthew Goode, Edward Bluemel, Louise Brealey, Malin Buska, Aiysha Hart, Owen Teale, Alex Kingston, Valarie Pettiford, Trevor Eve, and Lindsay Duncan. Based on the All Souls trilogy by Deborah Harkness, the story centers on historian Diana Bishop (Palmer), who has been trying to avoid her family’s witchcraft legacy. 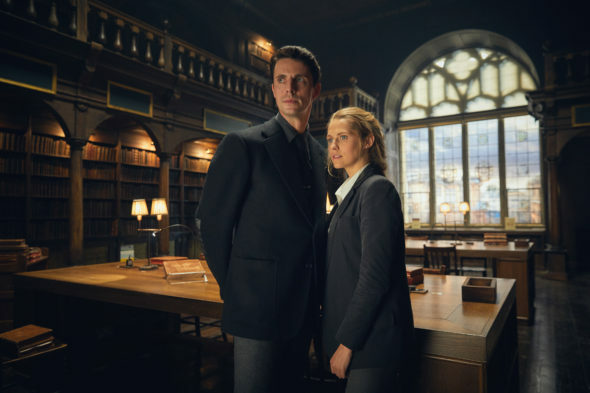 When Diana stumbles upon a bewitched manuscript in Oxford’s Bodleian Library, she falls headlong into a perilous mystery and in the sights of the mysterious geneticist Matthew Clairmont (Goode), a vampire. The first season is simulcast on BBC America and AMC.